A quick fix-it lunch for Meat Free Monday today. There is a wonderful array of winter squash in the supermarkets and on the allotments at the moment, and so I decided to take full advantage of this and add yet another autumnal butternut squash recipe to the blog. 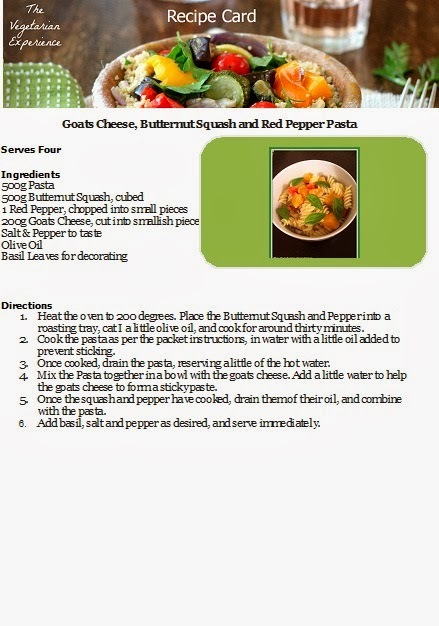 I made this delicious Goats Cheese, Butternut Squash and Red Pepper Pasta recently as a quick fix for lunch. 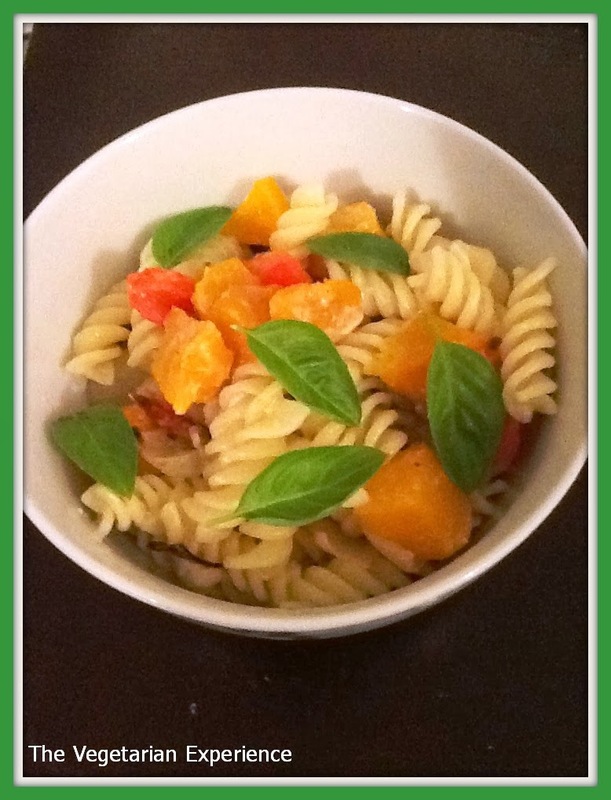 I love the colours of food, and as creamy pasta makes quite a bland canvas, I decided to brighten it up with some wonderful oranges and reds to celebrate the season, and also added some basil leaves for even more colour and flavour. I find that people sometimes get so bogged down in tomato bases for pasta sauce, that they forget there is a whole array of cheese which can be mixed with pasta to provide a creamy sauce with a full bodied flavour. When mixing in my goats cheese to the pasta, I reserved some of the cooked pasta water to help the goats cheese form a creamy sauce - just enough to help the cheese stick to the pasta. I hope you enjoy this dish, and Happy Meat Free Monday! Heat the oven to 200 degrees. Place the Butternut Squash and Pepper into a roasting tray, cat I a little olive oil, and cook for around thirty minutes. Cook the pasta as per the packet instructions, in water with a little oil added to prevent sticking. Once cooked, drain the pasta, reserving a little of the hot water.7Mix the Pasta together in a bowl with the goats cheese. Add a little water to help the goats cheese to form a sticky paste. 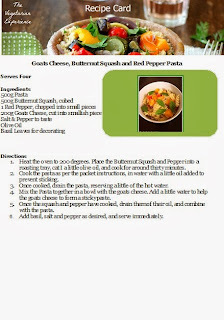 Once the squash and pepper have cooked, drain them of their oil, and combine with the pasta. Add basil, salt and pepper as desired, and serve immediately. Thanks Deena - the warmth is certainly needed at the moment with this cold weather! I agree, makes a treat to the cold weather with its beautiful colour.